Asian markets are trading flat with cautious tone especially Nikkei consolidating in narrow range of 200 points ahead of Fed meeting.ed is expected to more dovish as usual and to layout a plan to stop shrinking its $4 trillion balance sheet. USDJPY has jumped nearly more than 50 pips from recent low of 111.15 level. US markets has closed flat after 7 days of winning streak with Dow Jones at 25887 (0.10% lower) and S&P500 2832 (0.01% lower).Nikkei hits intraday low of 21501 and is currently trading around 21586. 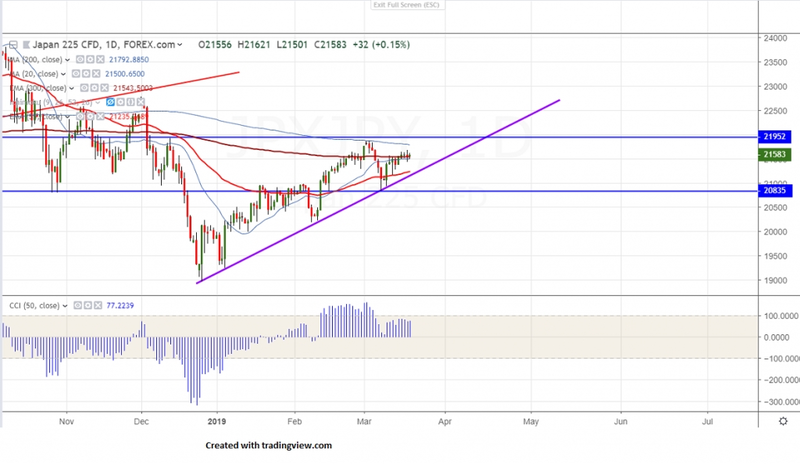 On the lower side, near term support is around 21400 and any break below targets 21195 (89- day EMA)/20991-21070 (100- day MA and trend line support)/20800/20500/20320.